The Hershey Harrisburg region combines the family fun of the international destination of Chocolate Town U.S.A.SM, featuring Hersheypark® and Hershey’s Chocolate World Attraction, with the state capital city of Pennsylvania. Conveniently located just off major transportation routes of I-81, I-83 and I-76, we’re easy to get to…an easy drive from Philadelphia, Pittsburgh, Baltimore, Washington DC and New York City. The region is home to four professional sports teams, and the community support is outstanding. The taste of success is exceptionally sweet when your event is held in Hershey, Pennsylvania. The Giant CenterSM is home to Hershey Bears® Hockey, as well as basketball tournaments, wrestling events, concerts and more. The state-of-the-art facility seats 10,500 for ice events and up to 12,500 (including floor seating) for all other events. Amenities include 10,000 parking spaces, a club lounge area, luxury suites, video board, LED stat & event board, food and beverage services and on-site catering. The building is next door to Hersheypark® and Hershey’s Chocolate World Attraction, giving guests even more entertainment options. FNB Field is the home of the Harrisburg Senators, AA affiliate of the Washington Nationals. Known to be a training ground for future baseball stars, Harrisburg has seen the likes of fast ball phenom Stephen Strasburg, power-hitting outfielder Bryce Harper and All-Star 3rd baseman Ryan Zimmerman as they transitioned to the big leagues. The stadium debuted in 2009 and was named Ballpark Digest’s Renovation of the Year in 2010. Amenities include the largest scoreboard in minor league baseball, corporate suites with private seating, boardwalk area encircling the playing field and a kids’ zone. The park is situated on Harrisburg’s City Island Sports Complex, so hosting an event here gives your athletes and spectators a perfect view of the beautiful Susquehanna River and the city skyline. 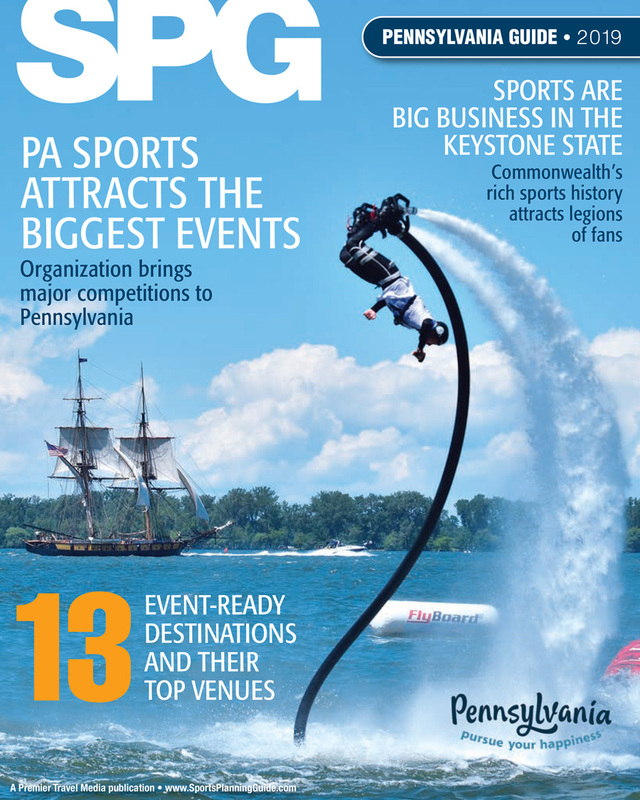 The PA Farm Show Complex & Expo Center offers more than one-million-square-feet of sports and events space under one roof. It’s ideal for hosting both single and multi-sport tournaments, championship games, exhibition matches, try-outs and whatever other sporting needs you might have. Event teams can rent SnapSports® flooring directly from the Hershey Harrisburg Sports & Events Authority for added versatility. Featured event space includes the WEIS Exposition Hall (172,000 square feet + 30’ ceiling) and the New Holland Arena (seats up to 7,318 – 28,000 square feet + 90’ ceiling). The facility is located in Pennsylvania’s Capital City of Harrisburg and is situated just off interstate routes leading to most major points along the Mid-Atlantic and East Coast. More than 8,000 sleeping rooms and world-class attractions like Hersheypark® are close by for the enjoyment of your event's attendees.